Why are cherries dropping? 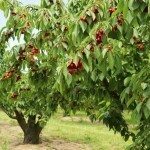 Fruit trees drop immature fruit for a variety of different reasons, and cherry trees are no exception. While the loss of immature and developing fruits may be alarming to gardeners, minimal early season fruit drop is natural and does not signal that there is a serious issue with the tree. One of the most common causes of a cherry tree dropping fruit results from pollination. Cherry trees can be divided into two categories: self-fruitful and self-unfruitful. As the name implies, trees that are self-fruitful (or self-fertile) do not require additional cherry tree plantings in order to secure a crop of cherries. Self-unfruitful plants will need an additional “pollinator” tree in order to produce fruits. Without the planting of additional cherry trees, self-unfruitful plants will not receive proper pollination – most often achieved by a strong honeybee population. Cherry fruit drop most often occurs in early summer, around the same time that blooms begin to fade. 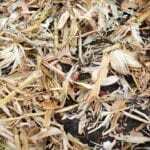 Since blooms that have not been pollinated are unable to develop into mature fruits, the trees will begin to shed any unviable growth. The process of dropping these fruits will allow for the trees to dedicate more energy to the growth of healthy, pollinated cherries. In addition to dropping unpollinated fruit, cherry trees may also drop fruits that cannot be supported by the plant. Factors such as available water, fertilization, and overall health of the tree contribute to the size of the cherry harvest. As a means of survival, the energy of the cherry tree is devoted to producing the largest possible number of fruits with viable seeds. Therefore, healthy and stress-free trees are able to produce abundant harvests. Though the initial fruit drop may be disappointing, the actual percentage of dropped fruits is usually minimal. A large percentage of fruit drop or total loss of fruit is likely indicative of other cherry tree problems or disease.